In the midst of a thousand unfinished knitting projects (there are two sitting on my desk at this very moment) it's sometimes nice to look at one that's done. At least, I assume that's the attraction to looking at pictures of knitted objects. That, and that they're often so pretty? I don't know about you, but I love looking at other people's work... seeing the colours they put together, the patterns they chose, the ways they found to photograph them. 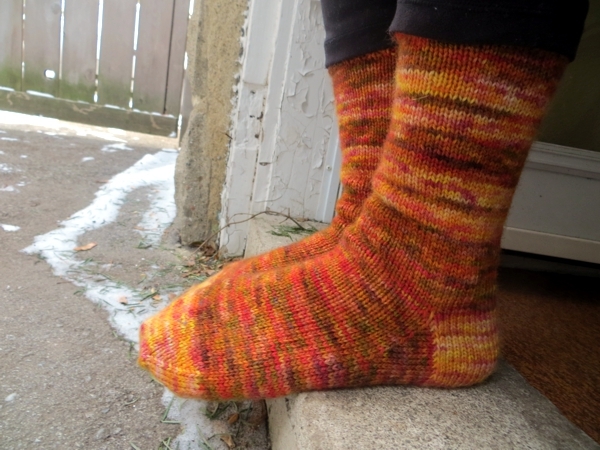 It makes me wish I could be more creative with my finished sock photos but let's face it: there are only so many ways to take pictures of socks, and after you've knit the first two dozen pairs it's hard to make those few approaches seem like fresh ones. Thankfully, one can always rely on the gorgeousness of the project in question. In this case - as always, a heavyweight mohair/romney blend from Stoddart - we have orange with a little yellow so barely off the spectrum from orange as to have been practically invisible as I worked. 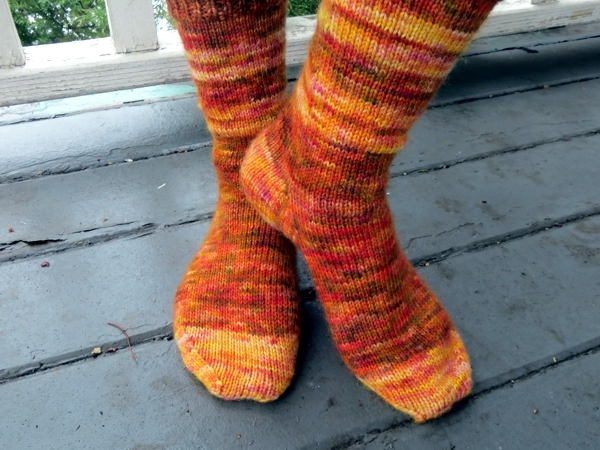 The detail stands out a little more now that they're done, but overall, these are probably the most subtle of all the socks I knit last fall. 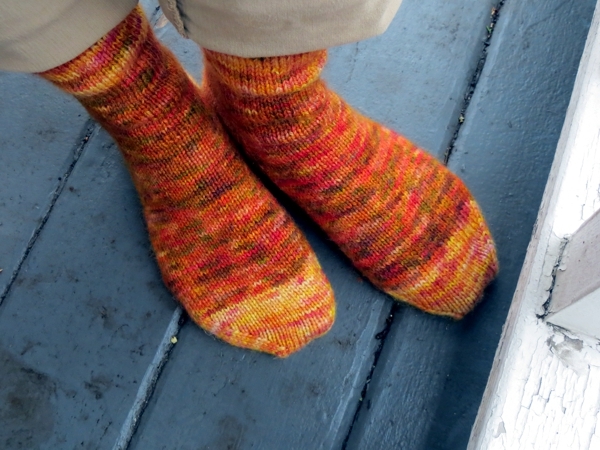 I don't think of myself as an orange person, but I do love orange socks. 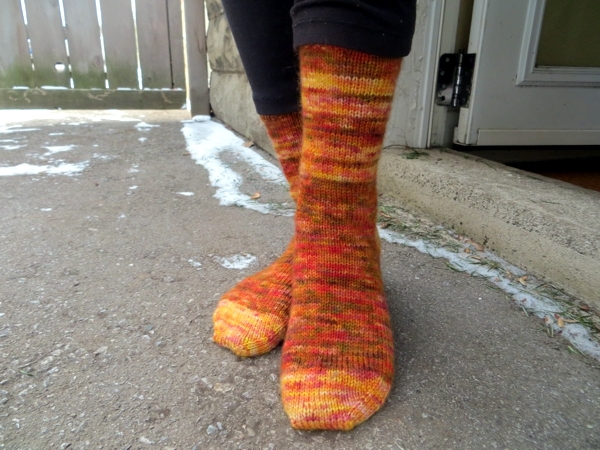 They look so fiery, and if it's cold enough out to want to wear heavy socks, it's cold enough to like being reminded of cosy crackling fires even if they are in close proximity to your toes. Also I just love wearing wool when I'm cold. Isn't that stuff amazing? Unless you're allergic to it, of course. So glad I'm not. There's something else for me to be glad about at the moment and I'll show you what it is, tomorrow! See you then and in the meantime, stay warm and have a great day. 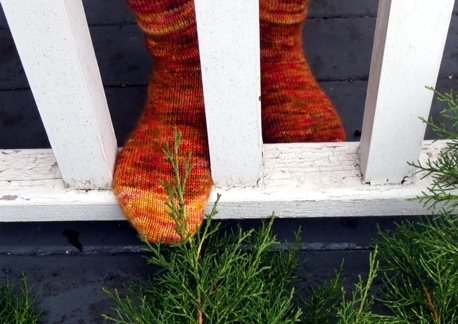 Hi Mary-Why do you put a pin on the heel flap while you're knitting a sock?